In addition to fiberglass and vinyl pools, customers have the option of a gunite pool. Gunite pools are concrete pools, but what makes these pools different is the method of installation. Instead of building wooden frames and pouring the concrete, the concrete is sprayed using a “gun”. Hence, “gunite”. Gunite pools first started appearing post-WWII, as returning soldiers and their now-gainfully-employed wives used those GI bills and extra income to buy homes. At that time, the kidney-shaped pool became popular (thanks to TV’s birds-eye views into the homes of the rich and famous), and gunite was the best way to create unique shapes. That fact serves to highlight the number one characteristic of gunite pools: you can have most any size, shape, and style pool you want. The only limitations are your budget and your imagination. Want a guitar-shaped pool? A pool that looks like Elvis? A pool shaped like a moat around your home? Gunite is your answer. Since it’s concrete, gunite is amazingly durable, versatile, and attractive. The main disadvantage of gunite is the lengthy installation process. 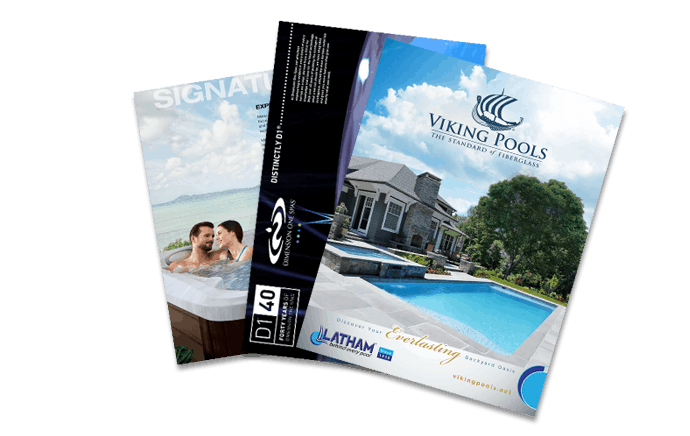 Since the sprayeed or “gunned” concrete has to set, it can take 4-6 weeks to get a gunite pool ready for use, compared to the usual 2-4 weeks it takes to install a vinyl liner or fiberglass pool. You may also hear that gunite pools require a lot more maintenance. While, technically, it is easier for algae to grow in the crevices of concrete, with today’s automated pool cleaners and modern chemicals, owners rarely notice much of a difference in the time or expense it takes to upkeep a gunite pool. Additionally, Aqua Pools offers regular maintenance plans, so we can take care of that for you!